Technology has entered education quickly. In developed countries children and teachers have access to hundreds of thousands of learning applications and games. However, the digital divide is significant: some parts of the world still lack the basic requirements for participation in the digital revolution, such as electricity. Development of solar power and mobile technology will narrow this gap, rapidly revolutionizing the access to devices for technology-enabled education globally. One such area of advancements in technology is teacher education, where massive open online courses (MOOC) and other Internet sources offer today’s teachers the means to learn about the best pedagogies. Even though there is still a debate about the effectiveness of using educational technologies and the results have been inconclusive, the use of technology-enhanced learning (TEL) in education is increasing inevitably as the technologies get cheaper. 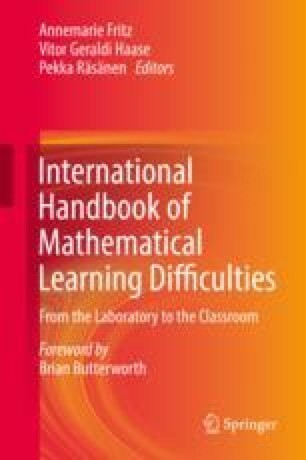 At the same time, the rise in controlled intervention studies of TEL to support children and adults with MLD is offering new possibilities to understand the mechanisms of learning mathematics. During the last 10–15 years, the focus has been on different types of interventions to develop the number sense of the children with MLD. Slowly the interest is turning to more comprehensive models taking into account the core features of numerical understanding, the multiple concepts and representations in mathematics, and the cognitive skills needed in numerical processing, as well as the best pedagogical practices of special needs education.